View More In Digital Cameras. Never let the extreme conditions stop you with the PENTAX K-70. This compact, lightweight, DSLR features the PRIME MII engine with a newly designed Accelerator Unit and a 24.24 megapixel AA-filter-less APS-C CMOS sensor for high definition images. Enjoy faster readout with 6 frames per second shooting of 14-bit RAW image data. Minimize camera shake with in-body SR (shake reduction) to assure sharp, blur-free images, even in demanding situations. Built for the toughest of shooters, this dustproof and weather-resistant camera is constructed with 100 different weather seals of protection, guarding it from the harsh environments of travel, landscape and nature photography. Built with the photographer in mind, the PENTAX K-70 offers a vary-angle LCD to facilitate creative compositions. Astronomy photographers will rejoice with the addition of a Night Vision Red Light LCD to enhance those low light situations. 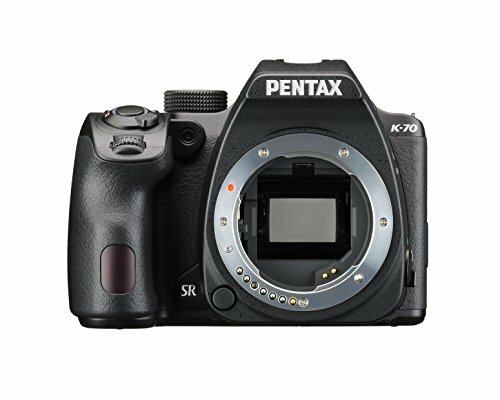 In addition to standard interval shooting, the PENTAX K-70 also features ultra high resolution 4K interval movie. It’s equipped with built-in Wi-Fi, for easy mobile transfer and social media sharing of your adventures. Take on all the extremes with the PENTAX K-70, while never compromising on image quality. If you have any questions about this product by Pentax, contact us by completing and submitting the form below. If you are looking for a specif part number, please include it with your message.